Other Products by Gen-Tec. Search other Amino Acids products. Gen-Tec L-Tyrosine is sourced and packed by Gen-Tec themselves so you know you are getting a premium product. Gen-Tec Nutraceuticals is the new amino acid range by Gen-Tec and provides 100% pure, pharmaceutical L-Tyrosine. Gen-Tec L-Tyrosine plays a role in the formation of neurotransmitters and may increase alertness, focus and concentration levels. Being a precursor the thyroid hormones, Gen-Tec L-Tyrosine may also assist thyroid function and thus metabolism. 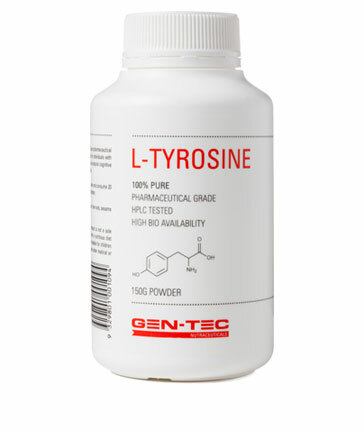 Gen-Tec L-Tyrosine is highly bioavailable and HPLC tested for potency. Mix 400mg of L-Tyrosine in water and consume 20 minutes before exercise or during periods of prolonged concentration.